About: The Handmaid’s Tale meets Blood Red Road. In a not too distant dystopian future women are hunted, sold as livestock, and inevitably bred to the highest bidder. Aya is a 15 year old girl living on the fringe when she is caught and taken to the capital for auction. A good half of the book is spent character building as Aya plans failed after failed escape attempts and tells sometimes loquacious stories of her life to a handsome horse-handler mute. Anyhoo, if you can get through the sometimes necessary and sometimes anticlimactic character building you are in for a fast paced adventure! 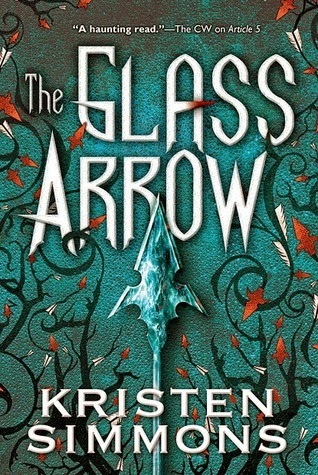 What I Liked: I didn’t know I was going to like this book as much as I did. Though the ‘sometimes loquacious stories’ occasionally distracted from the action, it was for the better, as well as the slow burn relationship between Aya and Kieran. Since Aya has been living on the fringe with a tribe of women her whole life, her conversations with Kieran are revealing of the first time she has ever interacted with anyone male, especially someone male who is kind, strong, and gentle. I love Simmons’s handling of gender roles and assumptions. I also love that this is a stand-alone novel packed with adventure, action, intrigue, romance, and fabulous world building ! This entry was posted in adventure, Audrey, dystopian, female protagonist, love and tagged adventure, Audrey, Dystopian. Bookmark the permalink.